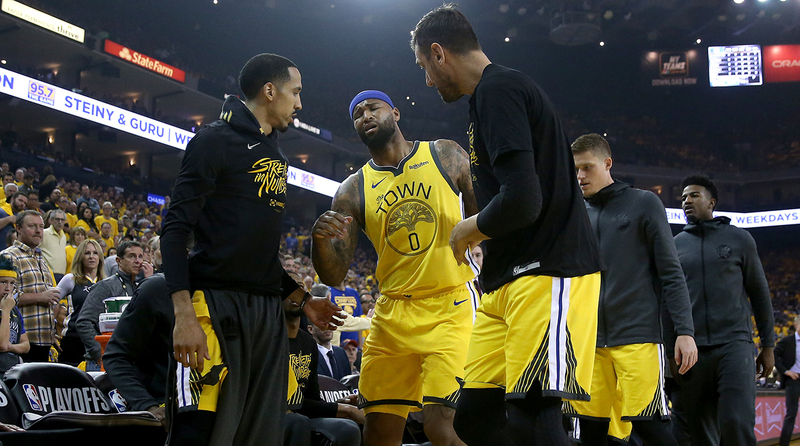 Whichever way the Warriors intend on winning a third straight title, it will no longer include DeMarcus Cousins, who went down with a season-ending quad injury on Monday night against the Clippers in a game Golden State memorably managed to lose. There was a lot of Lou Williams and Montrezl Harrell, not enough Kevin Durant, who fouled out, and a lot to reckon with. You have to feel for Cousins, All-Star talent making his debut in the postseason. His career remains in something of flux as he approaches age 29. But he’s always been a luxury for the Warriors. There’s nothing more illustrative than the fact his torn left quadriceps came at the outset of a game that, at one point, they still led by a whopping 31 points. Granted, Golden State found an exceptionally creative way to lose on Tuesday night. The fact nobody expects them to lose a first-round series says more about the impact of his absence than anything. Say what you want about where the Warriors are headed after the season, or where their players might be headed in free agency. This isn’t exactly crisis mode for a team that’s done nothing but prove and re-prove its dominance over the last half-decade. Internet maelstrom and televised brimstone be damned, Cousins choosing the Warriors was never going to be the summer’s most impactful signing. Of course, they’d won three titles in four seasons without him. In some ways it was always going to be more of a psychological shot across everyone else’s bow—rival teams, fans, and concerned observers alike. Golden State has specialized in making 82-game seasons feel irrelevant on the surface, and at their best, they can do the same for any given playoff series. We knew all of these things to be true before Cousins signed for one year at an injury-related discount. They remain relevant. Let’s take a beat to appreciate Cousins’ swift rehab from a fully ruptured Achilles. After missing about one year, he returned ahead of schedule to average 16.3 points, 8.2 rebounds and 3.6 assists and 25.7 minutes in 30 regular-season games. That’s remarkable production, in keeping with his history. It’s unclear how much he can demand on the open market with his recently checkered health, but he proved he could be a fit as a complementary piece with the Warriors. Make no mistake: they aren’t really replacing what he brings to the table with some platoon of Kevon Looney, Jordan Bell and 34-year-old Andrew Bogut. Someone will have to rise to the occasion in a physical series that they can’t take for granted. At the end of the day, Steph Curry, Klay Thompson and Durant are all on the same team. Maybe we’ll see Golden State play smaller and faster again—they certainly won’t be playing much through the post. But they are still fundamentally who they are, and as enjoyable as it was to watch the Clippers turn the tables, it’s unlikely the Warriors are about to get blitzed three more times in their next five games. In asking the question of how much their championship expectations can be reasonably dimmed, if at all sans Cousins, takes us back to the same, dark, frustrating, does-anything-even-matter place we all were on the day he signed. There’s probably some irony in that. The Warriors were always good enough that they didn’t need him to be favored in the first place. In all likelihood, in the end, they still won’t need him to get the job done.